Current Residence: East Greenbush, N.Y.
DeFrancesco is considered one of a number of young up and coming U.S. steeplechasers, after leaping on to the national stage in 2002 with her fourth-place finishes at both the USA Outdoor Championships and the NCAA Championships. She is the James Madison school-record holder in the steeplechase, outdoor 3,000m and indoor (16:22.64) and outdoor 5,000. 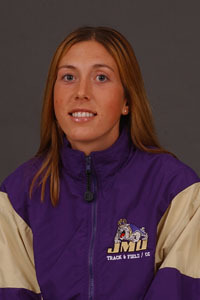 Selected her college team抯 co-MVP in 2001 and 2002, DeFrancesco was named JMU抯 Female Athlete of the Year for the 2001-02 season�.a member of the Averill Park High School cross country team that won New York state and Section II class B championships in 1995 and 1996, and Colonial Council championships in 1995, 1996 and 1997. Also known for her prowess as a cross country runner, DeFrancesco earned All-America status following her 30th-place finish at the 2002 NCAA National Championships. A Kinesiology major at James Madison with a concentration in human movement studies and a Dance minor. 2002: 4th at USA Outdoors (10:00.37)�h at NCAA Outdoors (9:56.07)�th at NCAA Cross Country Championships卹anked #3 in U.S. by T&FN...best of 9:56.07PR. 2001: 10th at USA Outdoors (10:12.24)�h at ECAC卋est of 10:12.24.